I wasn’t expecting to go down a rabbit hole when I received an April 18, 2019 email announcement from Vancouver’s Curiosity Collider about an upcoming April 26, 2019 event but why not join me on the trip? Curiosity Collider is co-hosting [emphasis mine] a special evening event with authors Ria Voros and Elizabeth Tasker. Ria and Elizabeth seem to be authors of a very different type: Ria is a YA novelist, while Elizabeth is an astrophysicist who writes popular science. The two authors will discuss how they came to work together unexpectedly through Ria’s novel. Ria will explain the process and research for her novel, The Centre of the Universe, and how the use of space metaphors help explain relationships between the characters. Elizabeth will then cast a scientific eye over these same metaphors, before moving on to talk in more depth about her own research and book, The Planet Factory. When: 7:00pm on Friday, April 26, 2019. Book signing to follow immediately after the event. UBC Bookstore will be on site with both Ria and Elizabeth’s books. Ria Voros is a YA author whose latest novel, The Centre of the Universe, explores the relationship between mothers and daughters and also explores a teen’s passion for astronomy. Ria has an MFA in creative writing from UBC and her books have been nominated for several awards across the country. She writes, teaches and lives in Victoria. Elizabeth Tasker is an astrophysicist at Japan’s national space agency, JAXA. Her research uses computer models to explore how stars and planets form. She is a keen science communicator, writing principally about planets and space missions for publications that have included Scientific American, Astronomy Magazine and Room, and she is a regular feature writer for the NASA NExSS ‘Many Worlds’ online column. Her popular science book, The Planet Factory, comes out in paperback in Canada this April. Curious as to what Tasker, an astrophysicist working in Japan, is doing here in BC, I noted the event is being cohosted by UBC’s Department of Physics and Astronomy (presumably Tasker is visiting colleagues and/or engaged on a sabbatical leave) along with Curiosity Collider. Not so coincidentally, Theresa Liao is the communications coordinator for the UBC department and is a member of the Curiosity Collider ‘team‘. The Royal Astronomical Society of Canada (Victoria Centre) will host the celebrations for International Astronomy Day [emphasis mine]. Join us and explore the mysteries of the universe! Segue: I found more than one International Astronomy Day for 2019., the April 27, 2019 date in Victoria, BC, an April 28, 2019 date, and a May 11, 2019 date. As well, there is an International Astronomy Week being celebrated May 6 – 12, 2019 (as noted on the Royal Astronomical Society of Canada’s (RASC) Astronomy Events webpage). Lots of options for folks. Have you ever wondered how writers develop their stories? Have you ever wanted to write your own novel? Join us Sunday, April 28th  to find out how popular science author Dr. Elizabeth Tasker and Young Adult novelist Ria Voros develop their work. There is no charge to attend and all ages are welcome. Learn how a shared passion for science and astronomy, and Ria’s latest novel ’The Centre of the Universe’, lead to a collaboration between these two authors. Ria will be sharing the backstory and process she used to develop ’The Centre of the Universe’, and how she used space metaphors to help explore relationships between her characters. Elizabeth will shed a scientific light on the metaphors in Ria’s work before talking about her own research and book ’The Planet Factory’. We will close the talk with a Q&A and book signing. Located in the lower level auditorium. Dr Elizabeth Tasker is an associate professor at the Japan Aerospace Exploration Agency (JAXA), Institute of Space and Astronautical Sciences (ISAS). Her research uses computer models to explore the formation of planets and galaxies. Her new book, The Planet Factory, tells the story of exoplanets, planets orbiting stars outside of our solar system. She’ll be joined by Ria Voros, a Canadian author who’s new young adult book, The Centre of the Universe, follows 17 year old Grace, whose mother is missing. Grace is fascinated by exoplanets and meets Dr Tasker as a character in the story. Both will discuss how they met and a bit about each of their books. Click here for more details on how to find the Centre. Our events are independent of the Seniors’ Centre and are open to people of all ages and backgrounds. Now you have one more option. This entry was posted in science communication, Vancouver, writing and tagged BC Humanist Association, Curiosity Collider, Elizabeth Tasker, HR MacMillan Space Centre (HRMSC), International Astronomy Day 2019, Japan Aerospace Exploration Agency (JAXA), Passion for Astronomy: A Tale of Two Authors, Ria Voros, Royal Astronomical Society of Canada (RASC), Royal BC Museum, Science and Storytelling: How discoveries of new worlds help tell stories of family, Space and Storytelling; an evening of astrophysics and creative writing, The Centre of the Universe, The Planet Factory, University of British Columbia (UBC) on April 19, 2019 by Maryse de la Giroday. There are a couple of art/science (or sciart projects) available for viewing in Vancouver, Canada which I’m listing in what is roughly in date order with a few out-of-order additions at the end including a January 18, 2018 movie screening. Description: Science illustrator Jen Burgess graduated from California State University Monterey Bay’s renowned science illustration program in 2015, and since then the varied body of work she created has been idle in flat files. When the opportunity arose to share this work in person and find it some new homes, she could not resist. The work is primarily natural history subject matter, in a variety of media including graphite, pen and ink, coloured pencil, watercolour, gouache, acrylic, and digital. To reflect the location of the show, the theme of the show is “Work in Progress,” so adjacent to many of the pieces Jen will display some sketches, work in progress scans, photos, and/or write ups, so you can get a glimpse into the process of creating each piece. In addition, there will be work from Jen’s June 2016 self-imposed residency in Haida Gwaii, from the show entitled “On a Tangent Tear” which was on display at Emily Carr House in Victoria in September 2016. Most original works and some prints will be available for sale. Please join Jen Burgess and the team at Creative Coworkers on Friday November 24th to have a drink after work or after dinner and see some artwork before heading out to your late evening plans. There will be a cash bar and some light snacks provided. Admission is free but donations will be gratefully accepted if you would like to help Jen cover the costs of framing. Please RSVP! The show will be up from November 24 through January 24, so if you cannot make it, please stop by and see the work on your own time. There may be plans afoot for a closing reception as well, perhaps with a silent auction. Stay tuned! Colour your way through nature on a giant mural that showcases ecosystems from BC and around the world. Presented by Hemlock Printers, artist Angela Gooliaff explores keystone species in both the terrestrial and aquatic ecosystems, employing feminine symbology of peace and wisdom, and story through a giant interactive colouring book mural. 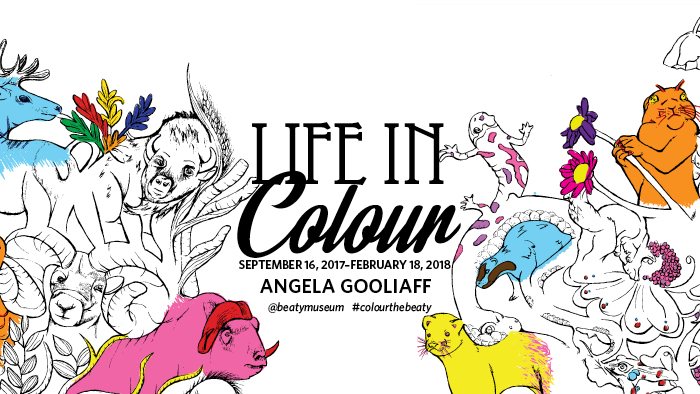 “I have connected my investigation of keystone species with the adult colouring book movement as an interruption to the current story of the natural world,” says Gooliaff. Is there anything beyond the universe? What came before the Big Bang? These are questions that don’t have answers, but we have theories! This installment of Cosmic Nights we delve into theories of the Multiverse! Cosmic Nights is a themed party featuring a custom planetarium show, music, drinks, science demonstrations, games, and a special guest lecturer – all surrounding an exciting theme. Experience the Space Centre after hours in a 19+ environment! Cosmic Nights returns on Thursday, January 25  with Cosmic Nights: Beyond our Universe. Jump into multiple universes, the Big Bang and other ideas that are bending our cosmic minds. Select your preferred Planetarium Star Theatre show time and then come early or stay late to experience all this event has to offer! How did it all begin? What is the Big Bang Theory and what does this theory suggest about an end to our universe? Are there universes in addition to the one we live in? How do scientists even attempt to answer these mind-blowing questions? We’ll talk about some of the biggest questions about the universe and leave you with even more ideas to explore. Can there be more than one universe? Why is the Universe that we live in the way that it is? Does our existence imply that the universe has to have certain properties? Can we imagine universes that are quite different? What does the word “multiverse” even mean? These and other questions will be tackled in this special talk (and others quite like it, all across the multiverse!). Bio: Douglas Scott is a Professor of Physics & Astronomy at the University of British Columbia, who was trained in Edinburgh, Cambridge and Berkeley. He specialises in cosmology- the study of the universe on the largest scales and has co-authored more than 500 papers on a wide range of both concrete and speculative astrophysical topics. A fun, interactive science demo on string theory and quantum gravity – enough fun facts to impress at a cocktail party. Trivia prizes are also up for grabs! TICKETS: $20 early bird tickets until January 11th, $25 after. Tickets available online through Eventbrite. Or, save the service fee by purchasing in person at the Space Centre or by calling 604.738.7827 ext. 240. Beer from Red Truck Beer Company, wine frrom Hester Creek Estate Winery. Games by Starlit Citadel. 19+ event. All attendees will be required to provide photo ID upon entry. You can go here to buy tickets. Want to receive future calls for submissions? Update your email subscription options so you don’t miss out! This entry was posted in performing arts, science communication, Vancouver, Visual Art and tagged "Curiosity" and Creativity, Angela Gooliaff, Art = Science in Love, Art. Science. Fusion., art/sci, art/science, Beaty Biodiversity Museum, Big Bang, Call for submission: Night Shift "Quantum: Future Possibilities", Cosmic Night series, Cosmic Nights: Beyond Our Universe, CreativeMornings/Vancouver, Curiosity Collider, Curiosity Colllider Café, data visualization, David Ray, Douglas Scott, Geo-synth Music Video, Grand Unifying Theory, H. R. MacMillan Space Centre, Hemlock Printers, Jaymie Matthews, Jen Burgess, Katrina Wong, Life In Colour, Martin Krzywinski, Michael Unger, Mika McKinnon, multiverse theories, Nerd Nite Vancouver, Nerd Nite Vancouver v.32: Machine Learning Dr. Who and Exoplanets, On a Tangent Tear, Paige Blumer, quantum gravity, Raymond Nakamura, SciArt, sciart projects, Sciart Zine, science illustration, String Theory, The Making of A Science Illustrator, The Multiverse, Visualizing Medicine, Voirelia: A Dance Psychology and Philosophy Hub, Work in Progress on January 10, 2018 by Maryse de la Giroday.